We are pleased to announce Shasta Living Streets is a voting member of the Social Services Transportation Advisory Council in order to better serve you, our members, and our community. We frequently hear interest from our members for supporting RABA and improvements to transit. Our members want to use transit to get to and from the college or from home to work. We also have a number of members unable to drive, who are dependent on walking, bicycling and transit. Enables trips that include more walking and biking and promotes the active daily lifestyles that young people and older residents are seeking today. Reduces transportation costs for families and individuals, raising quality of life and encouraging economic well-being. 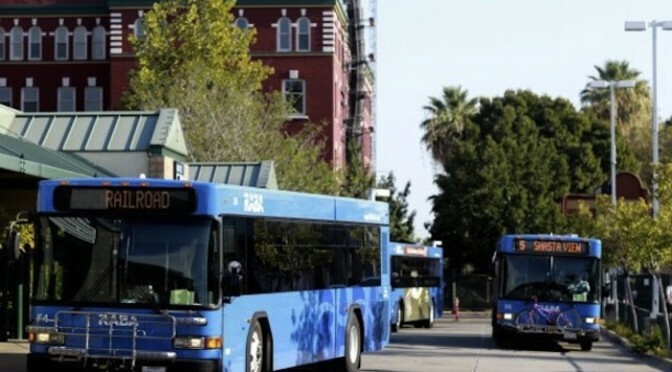 Helps secure new redevelopment funding targeted to transit related development. In California funds for redevelopment have pivoted, not vanished. This year alone $320 million is available through the Affordable Housing and Sustainable Communities program that will go toward development in downtown core areas that encourage walking, biking and transit usage.